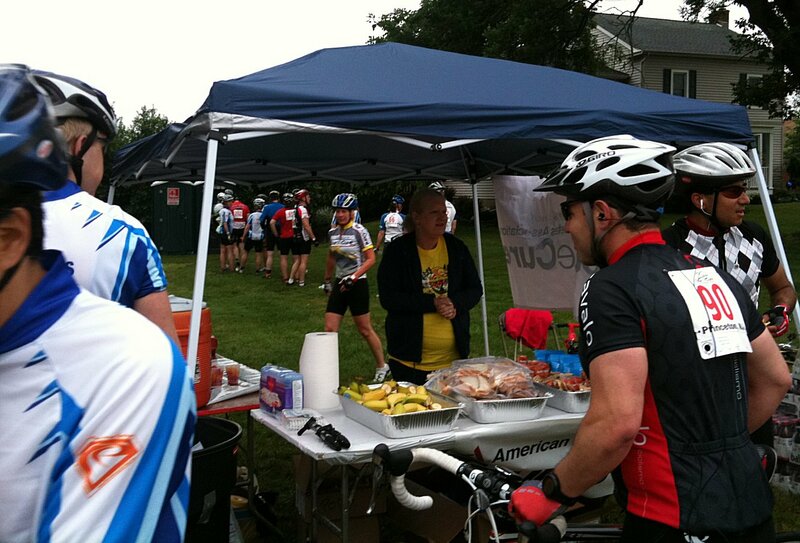 The Tour de Cure is a fund-raising bicycle event to benefit the American Diabetes Association. An extremely worthy cause, to be sure, but a ton of fun as well. This year was no exception. 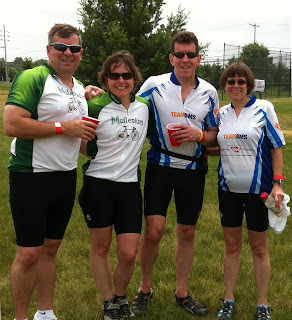 On Sunday, June 12th, Marilynn and I, along with Mary and Tom Kinslow, were part of Team BMS, riding 62.3 miles (a metric century!) in the Princeton Tour de Cure. No one falls and no one gets hurt (other than sore muscles). No flats, broken spokes or other mechanical problems with the bikes. Good riding weather ... not brutally hot and no rain! No one "bonks" (look it up if you don't know what that means). 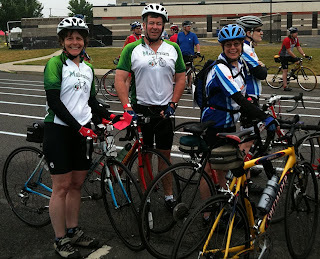 I'm here to tell you that, for Tour de Cure 2011, we were five for five! Earlier in the week, the weather forecast was bleak, calling for rain all Sunday morning. By race day, though, the situation had changed completely, and we ended up with biking weather that couldn't be beat. It was slightly cool with no wind and total cloud cover. How total was that cloud cover? Well, my Irish skin was outside for over 4 hours without sunscreen and didn't get burnt! 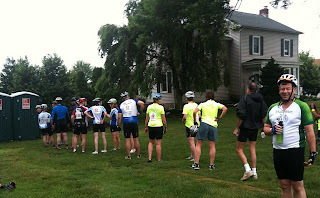 Although labeled the Princeton Tour de Cure, the ride never even entered Princeton. It started at the Grover Middle School in Princeton Junction and stayed completely east of Route 1. As such, we didn't get to experience the "Hills of Hopewell" or the Sourlands Mountains which were marquee attractions for Tours of the past. I must confess to missing the old route, but I'm sure that I'm in the minority. Just as important, though, were the port-o-johns, even if the lines were long! For such a well-run and organized Tour, there were a number of gaffes on the cue sheets and road markings. At one point in time, even the Ride Marshalls were baffled! Despite the confusion, we only made one wrong turn (costing us about a quarter of a mile); but there were a number of anxious moments along the ride as we frantically sought out road markings. After a little over four hours (averaging about 16 mph) we returned to Grover School to an enthusiastic reception, live music, free massages, and as much food as we could eat. 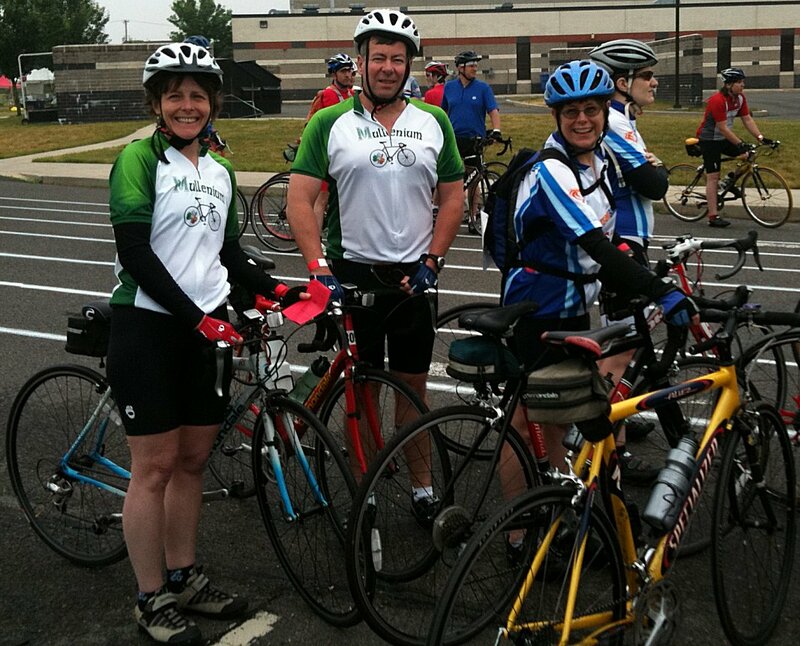 More importantly, Team BMS had raised over $18,000 for the American Diabetes Association. Thanks to everyone who supported the cause, and we'll see you next year!